We were delighted to get the most magical display of Niagara Falls in colour when we travelled there for an early birthday treat. Since we live in Toronto, it is easy for us to visit Niagara Falls over and over again. 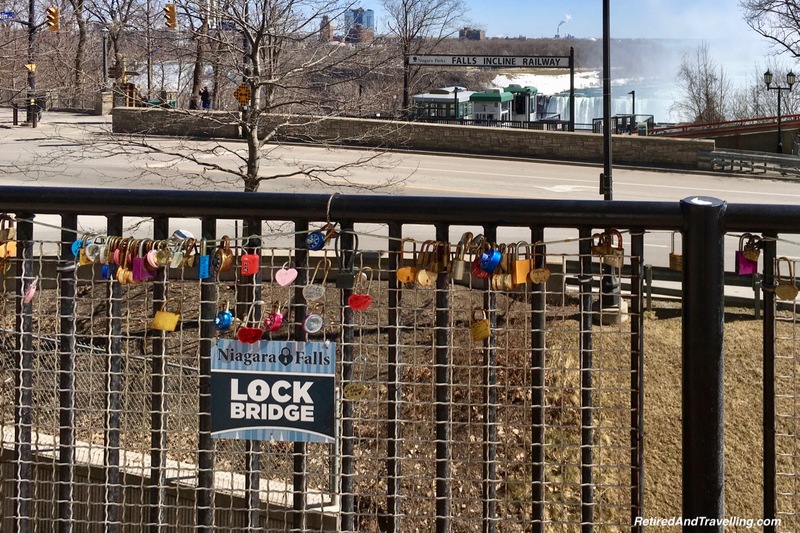 There is so much to see and do in the Niagara region. But it was always good when we had a special reason to visit. We toured the wineries in Niagara-On-The-Lake (NOTL) on the way to and from Niagara Falls. 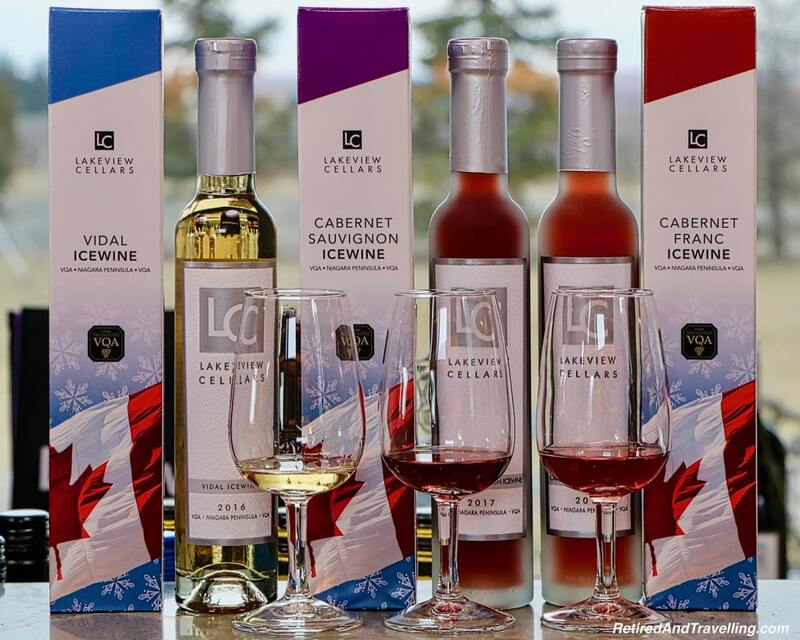 It was the perfect time of year to sample the great Canadian icewines. Our great suite for two days looked out over Niagara Falls. And we got the best views during the day, at sunset and for the night light show. 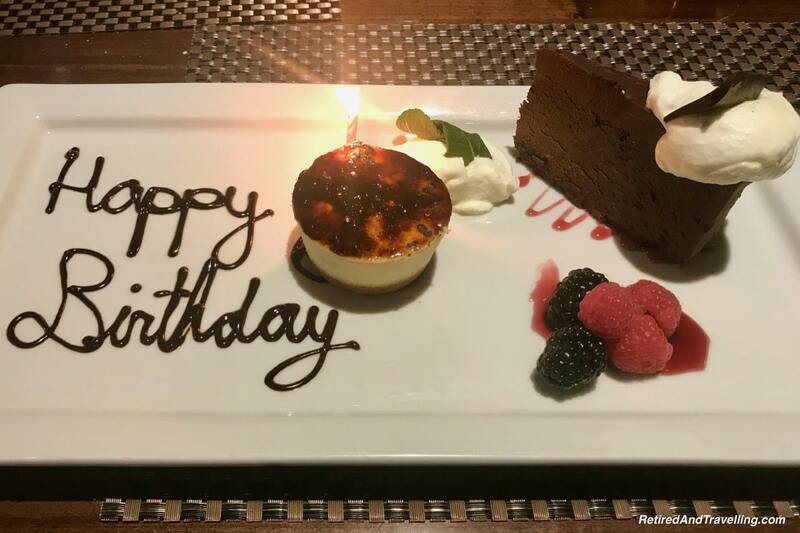 A special birthday dinner finished off our sweet visit. On the way to Niagara Falls we stopped in a few wineries in Niagara-On-The-Lake to sample icewine. I found a new favourite! 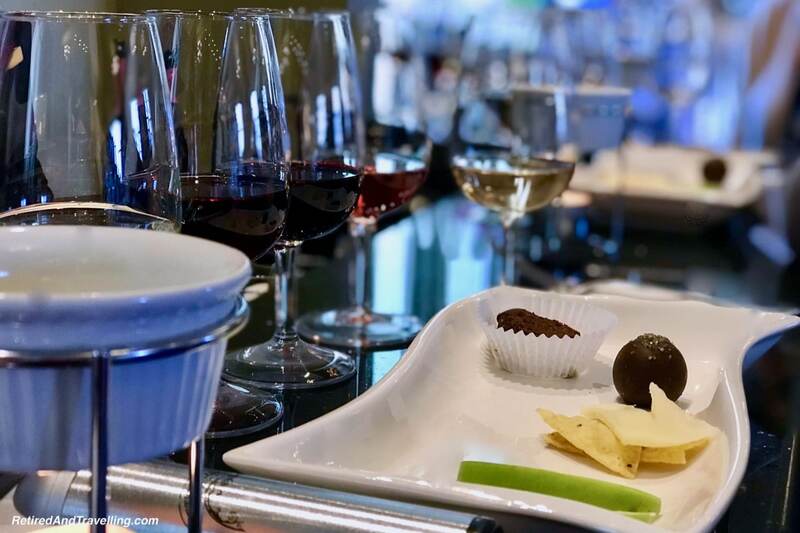 And we even did a wine pairing with cheese and chocolate. 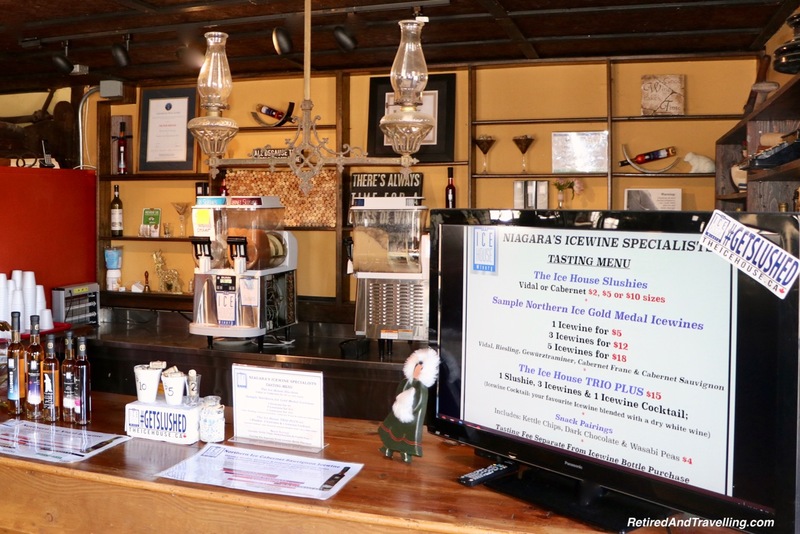 When we left Niagara Falls, we headed back and tried a few more icewines. Our first stop got us a great icewine slushy. And then we sampled our way through a comprehensive list of wines and icewines. 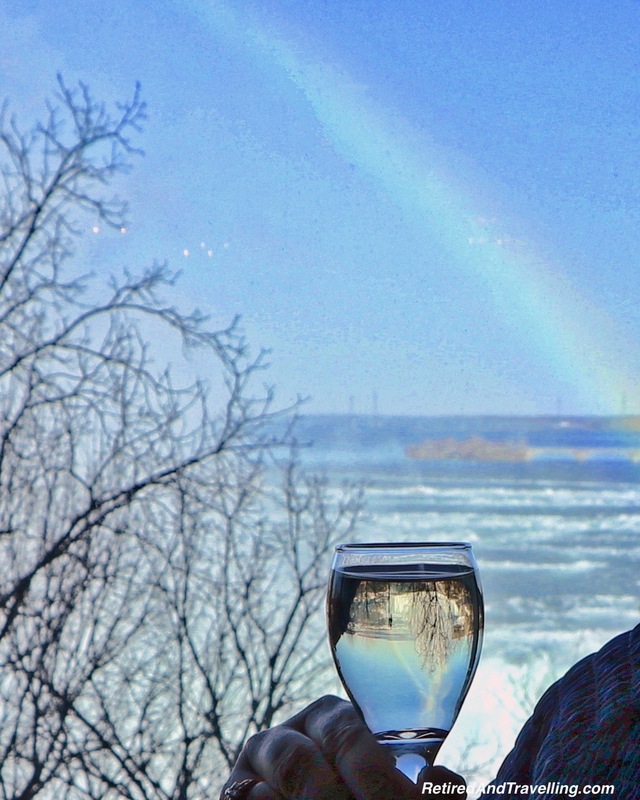 It was great to enjoy some icewine tastings on our visit to see Niagara Falls in colour. 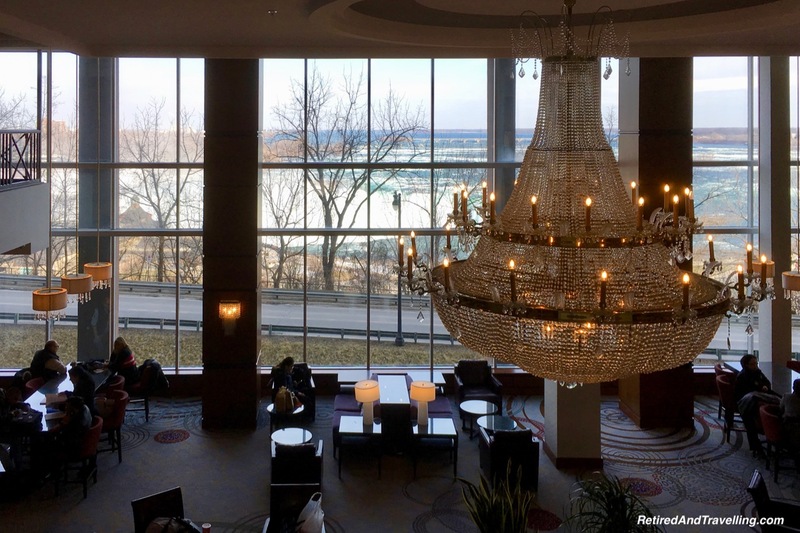 We checked into the Fallsview Marriott. 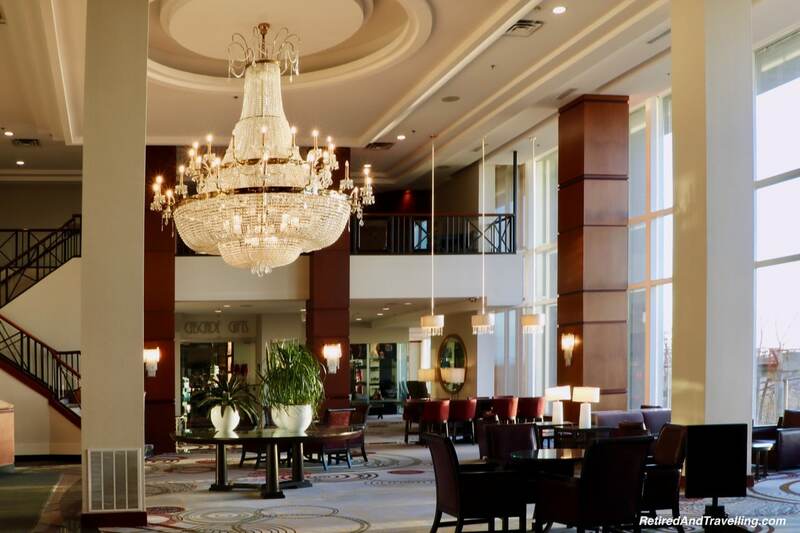 The hotel is situated right above the Horseshoe Falls in a premium location. When we had drinks at the bar, we even caught a rainbow. We were delighted that our room had a view out over Niagara Falls. It was great day or night. 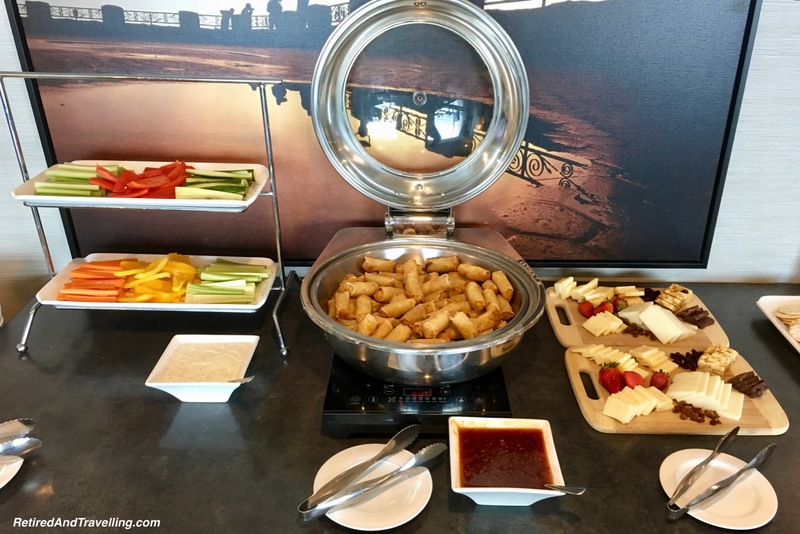 Our Bonvoy Titanium Elite status got us breakfast in the restaurant and access to the Executive Lounge for evening appetizers. 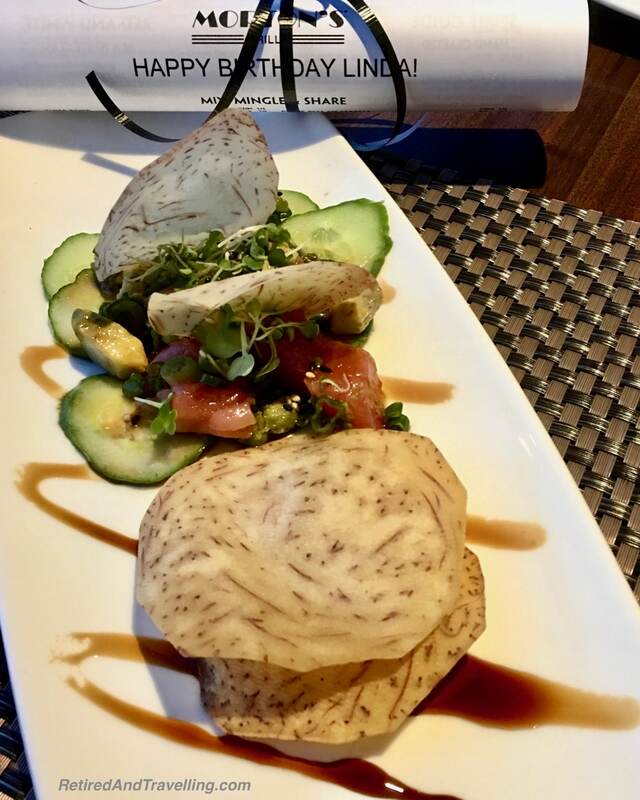 The package we had purchased included food discount coupons for both the on-site Morton’s Grill and for the Milestone Grill at the other Marriott across the street. We certainly did not go hungry. 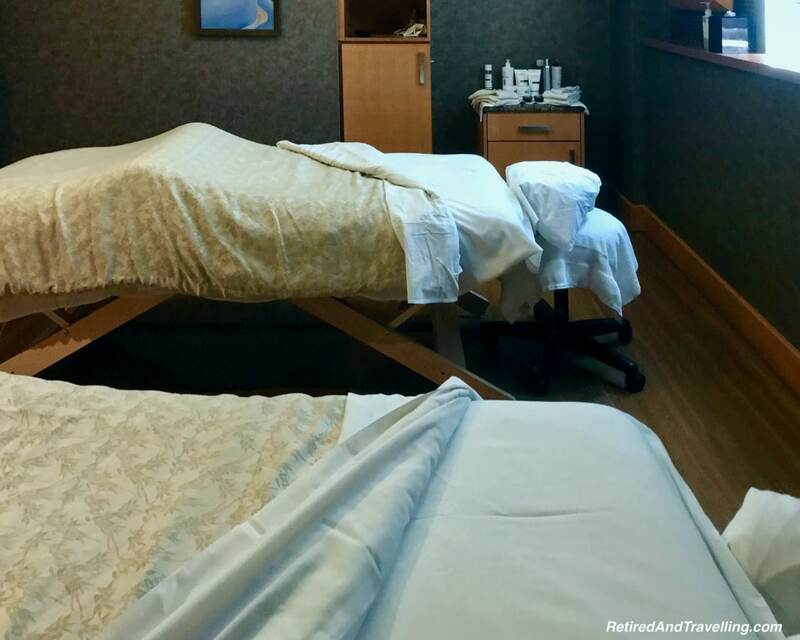 Since we were staying in Niagara Falls for an early birthday celebration, we splurged and booked the Romance Package at the on-site Serenity Spa. 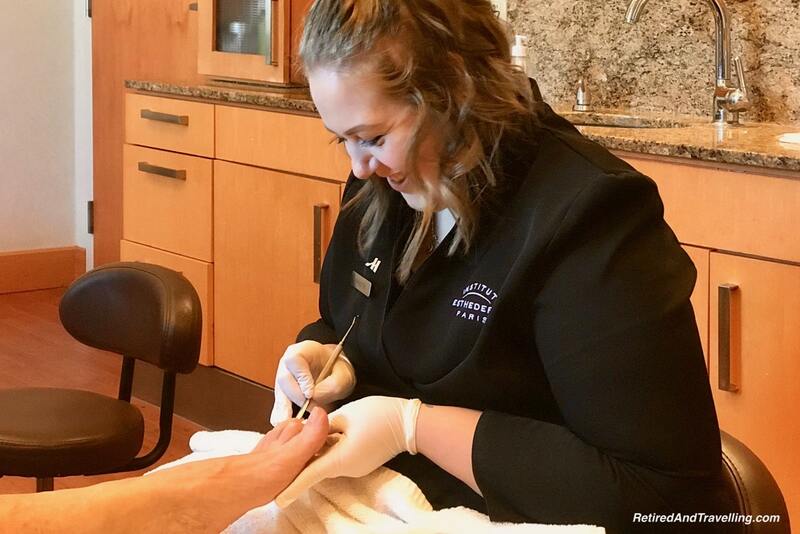 A couples massage and pedicures for two ensured we had a lazy and pampered day. We spent a lot of money for two days in Niagara Falls for my birthday. And we chose this hotel partly because we had Marriott Bonvoy Titanium status and have been treated well on other special occasions. But we were quite disappointed that this hotel did not meet the world class customer service standards we expected for such a premium location. 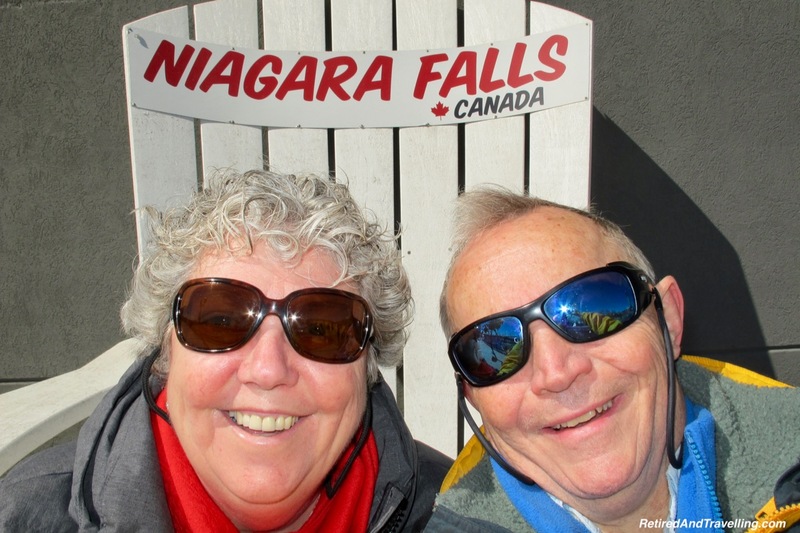 It was the only thing that marred our visit to see Niagara Falls in colour. It felt like the Horseshoe Falls were right below our window. The water tumbled down freely but there was still some ice at the bottom. The American Falls were off at an oblique angle. And it was interesting to see that they still had a fair amount of ice climbing up the falls. There was a great viewpoint walk at this higher level where the hotels are that we never found on previous visits to Niagara Falls. 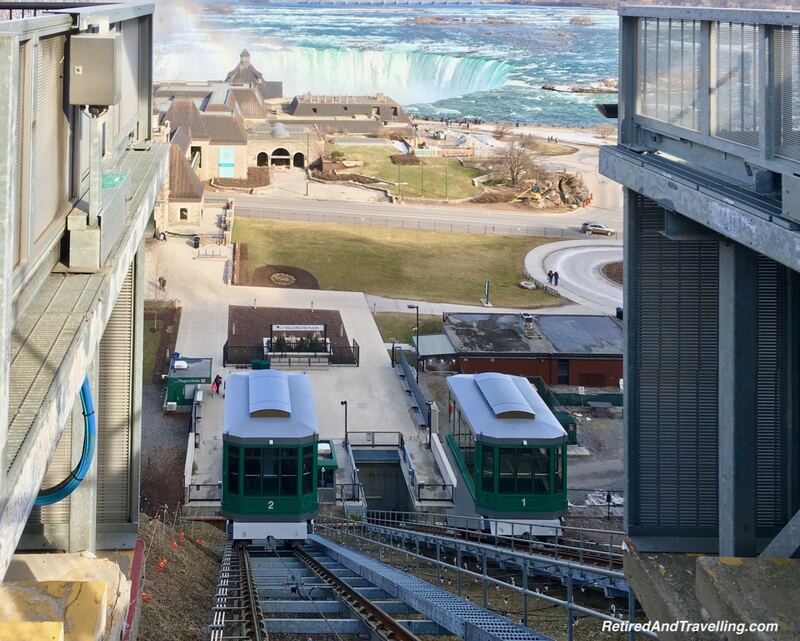 The Falls Incline Railway is the funicular that goes from this point down to the lower falls level. 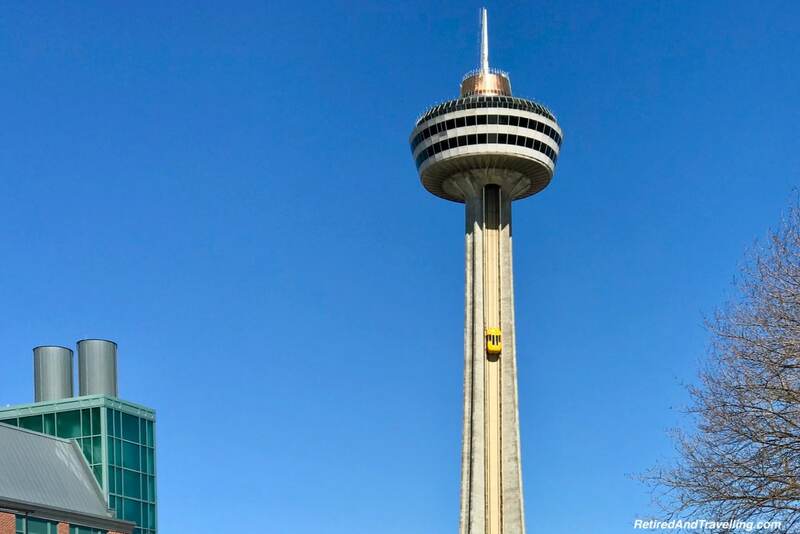 We walked past the Fallsview Casino and saw the Skyline Tower cars going up and down. Each viewpoint along the walkway gave us a slightly different angle. And at the end, we got our first clear view of the American Falls. It was great to enjoy this natural wonder. Some say it is the honorary 8th wonder of the world. 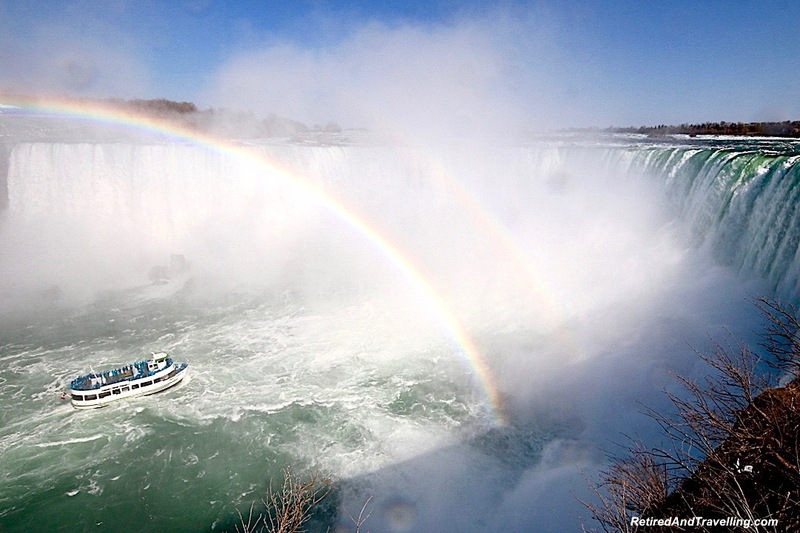 But we knew there was more to come when we saw Niagara Falls in colour. Niagara Falls during the day was a stunning sight to see. But when we caught it draped in colour, it was quite magical. The first colourful view that we got was a rainbow view. Several times we saw faint rainbows. Once we caught a partial rainbow. But it never climbed to arch between the falls. 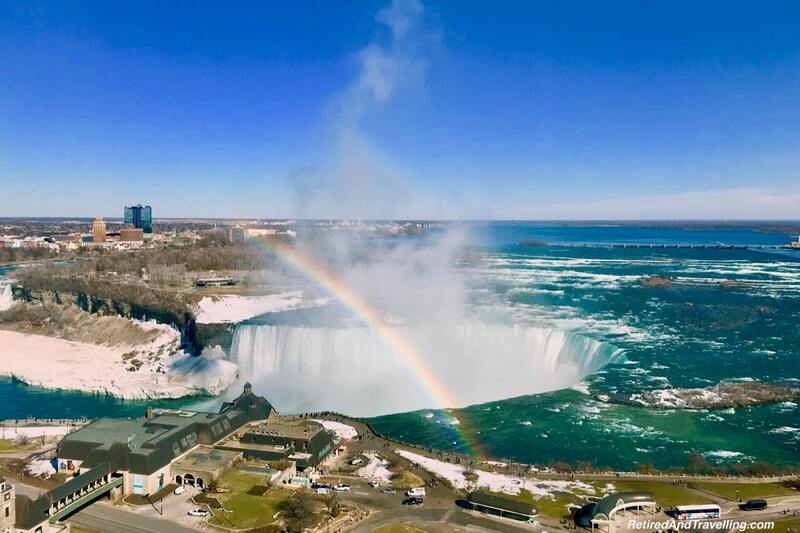 We were always excited on previous visits to Niagara Falls to catch the rainbow. We were up early to see if we could catch a sunrise view. The sunrise glowed through the mist coming off the falls. But we really were excited to catch the night light show on the falls. Both nights we stayed in Niagara Falls, we were mesmerized by the light show on the falls. It went for over 2 hours. The lights on the Horseshoe Falls were beautiful as they cycled through the rainbow of colours. 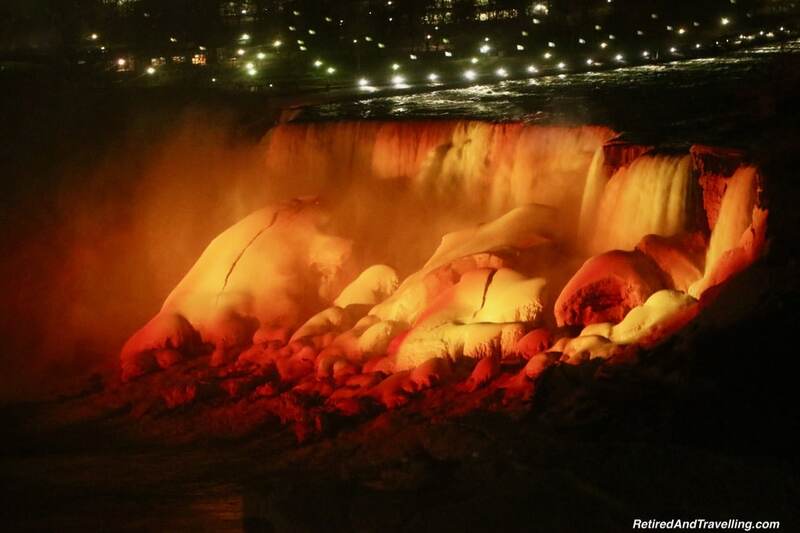 But the ice that remained on the American Falls created an eerily stunning light show. We thought about walking down along the upper walkway. But the view from our room kept us in place. 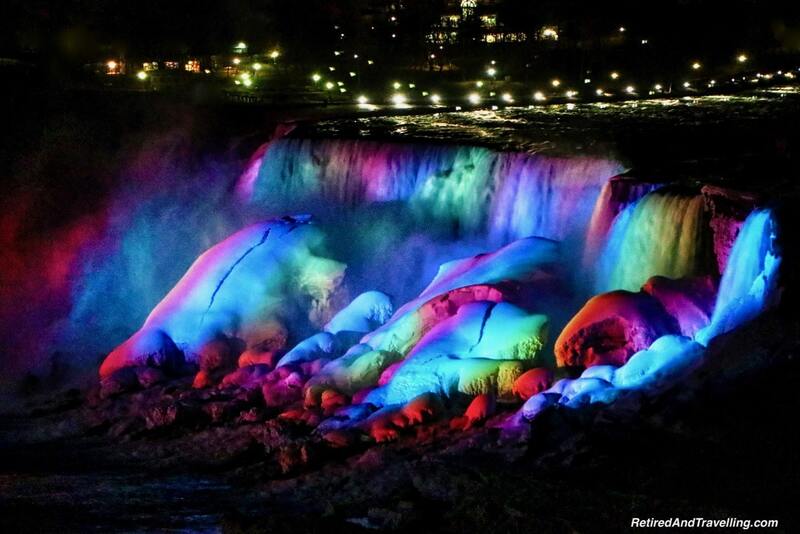 Plan to visit at night for the great night light show that bedazzles Niagara Falls in colour. Our trip see Niagara Falls in colour was timed to be right before my actual birthday. It started our 3 week long celebration. Shortly after Niagara Falls, we headed to the Ritz-Carlton Grand Cayman for 16 days of relaxation and pampering. David made sure to let the staff at Morton’s Grille know that it was my birthday when he made dinner reservations. Little did we know that Mortons really knew how to make a celebration special! We got a great seat with a view and ordered drinks. The Date Night fixed prix dinner was perfect for us. We loved that our menu had “Happy Birthday Linda” printed right on it. After we started with seafood appetizers, we ordered meat eater entrees. I fussed over my dessert choice. But I need not have bothered. David already had dessert taken care of. Not only was the cake plate decorated. But we also got a picture taken and given to us. The only thing I needed to do was move a few things on the cake plate to cover up my actual age. It might be a big milestone birthday, but I did not need to share which one it was. It was great to start my birthday celebrations at Mortons Grille on our visit to see Niagara Falls in colour. A birthday is always a great excuse to plan a few days away. We started the year for David’s birthday with a splurge at the Ritz-Carlton Montreal. 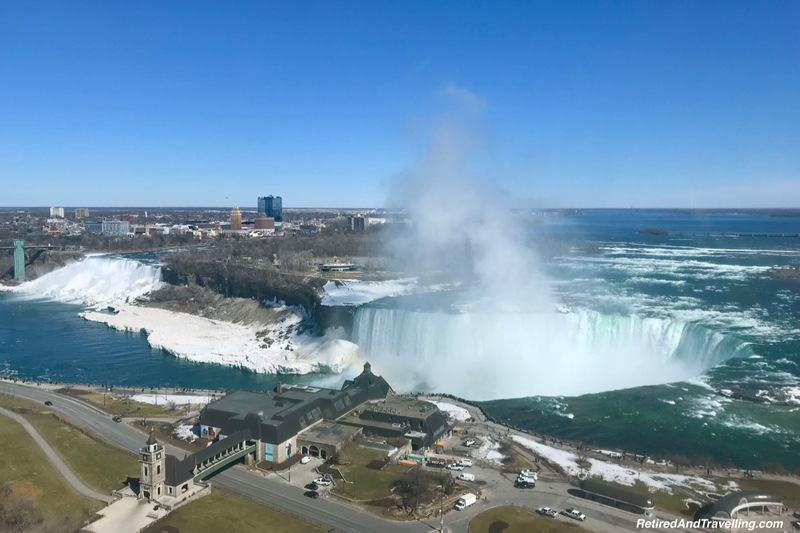 A short getaway for icewine tasting in Niagara and to see Niagara Falls in colour was the perfect way to start the celebrations for my big milestone birthday. Of course, 16 days at the Ritz-Carlton Grand Cayman was the perfect way to extend those celebrations. We enjoyed such a variety of views of Niagara Falls. Day views were awesome. 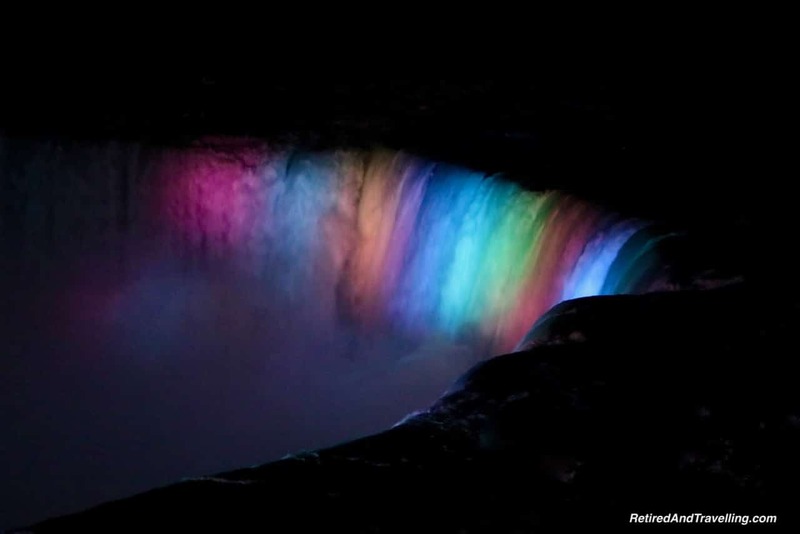 But the sight of Niagara Falls in colour was magical. It was great to return to Niagara Falls for this new experience. 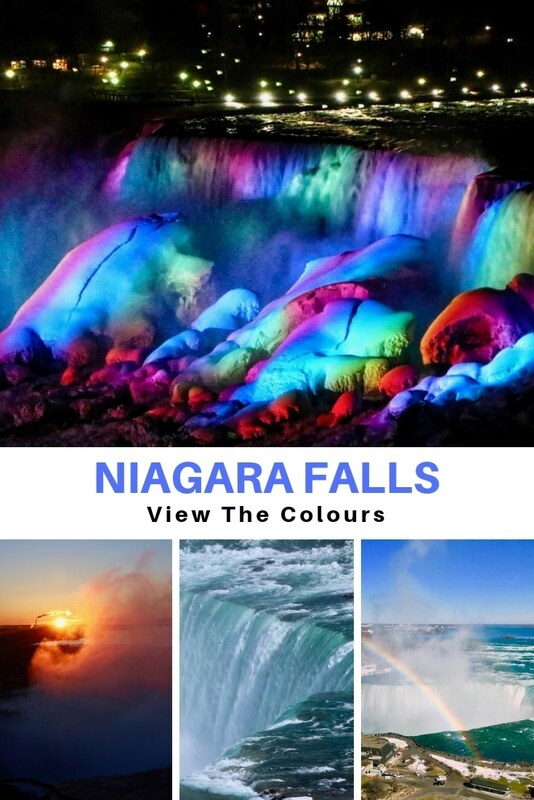 Have you seen Niagara Falls in colour? What was your favourite vantage point for the views? Wow it looks like you had an amazing trip! 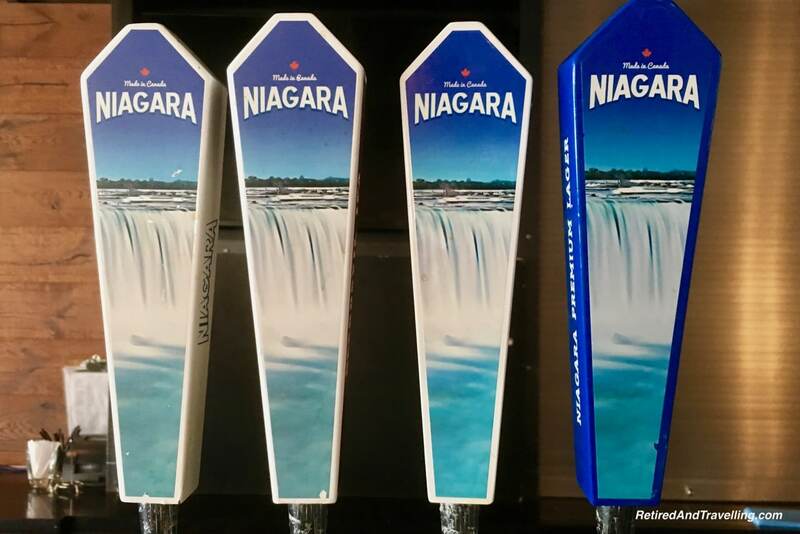 I have not made it over to the east coast yet, but when I do, Niagara is a must. I actually had no idea they had a light show like this. Thanks for sharing this experience! We love Niagra Falls! I believe we have visited it about 4 times with family. Every time is a great experience. 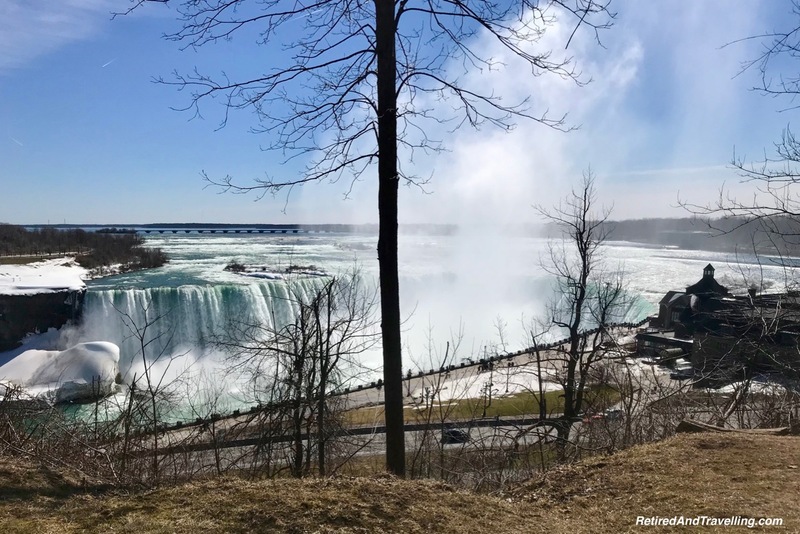 Fantastic tour and wonderful things to do and see in Niagara Falls – I do love the look of the falls in day time and night. I am totally speechless. 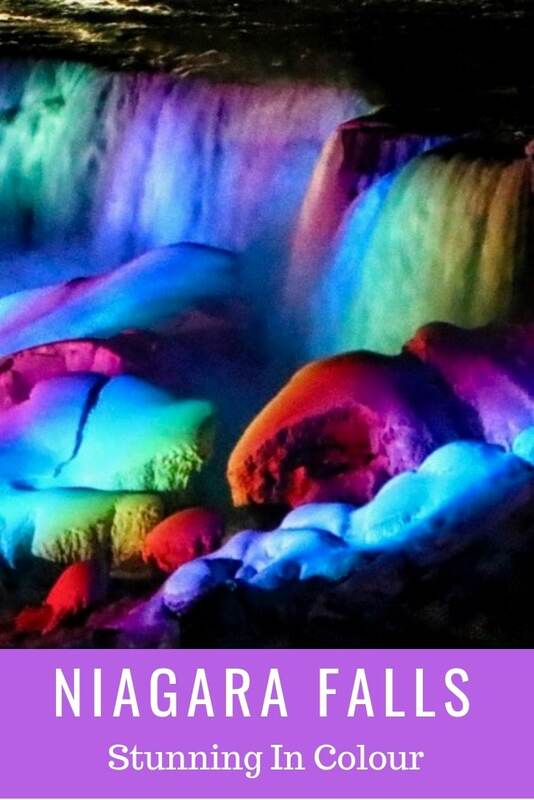 Photos of Niagara Falls in colours are just out of this world. I spend good 5-10 minutes just looking at your photos. 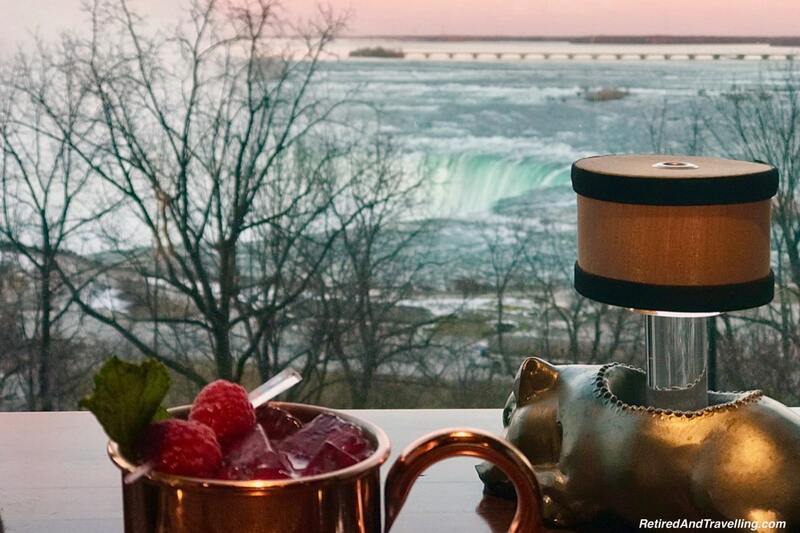 The view of the Niagra Fall from your room was also breathtaking. I can’t believe how can there be so much development close to the gigantic waterfall. And you can even go near to it through a boat. You can see how excited I am just looking at your pictures. I can’t imagine the expression and feeling of people seeing it the first time with their own eyes. Okay, so now I’m curious, what’s icewine? 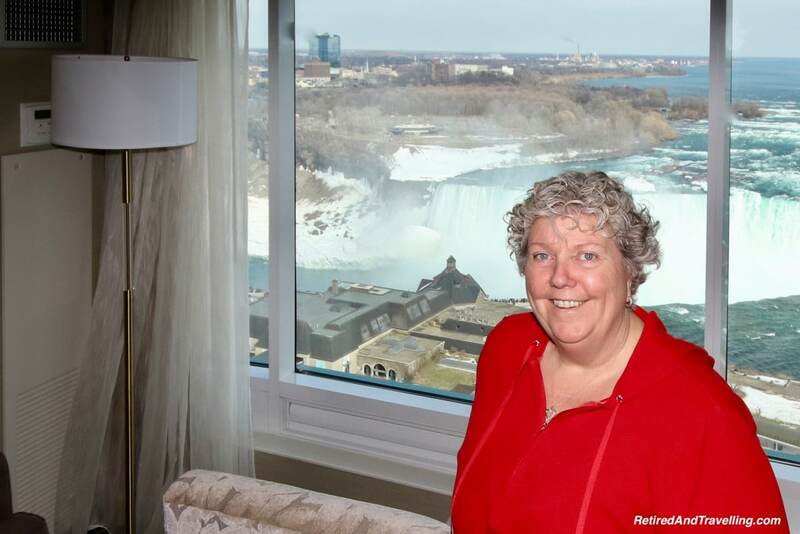 But that aside, I’m totally jealous of that view of the Niagara Falls from your hotel room. I would also stay just there to watch the falls at different times of the day instead of going out. You captured the light display beautifully. Wow, the height of luxury for your birthday. 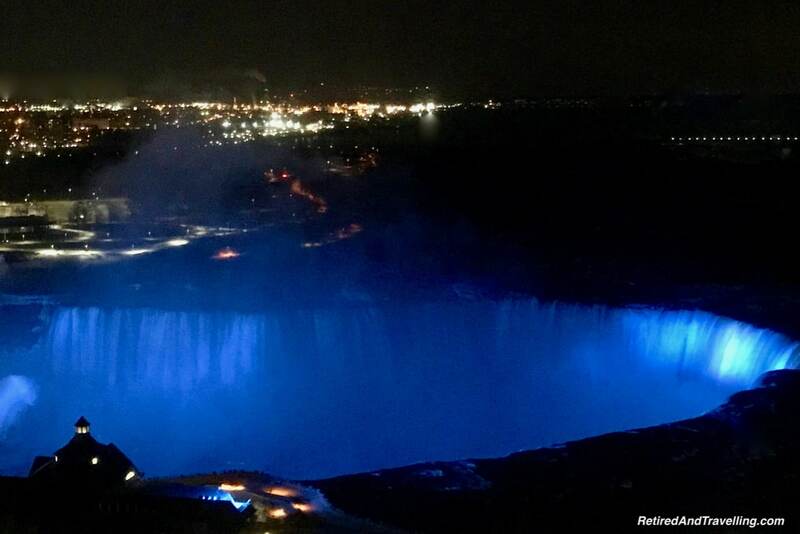 We saw those when we went to Niagara 7 years ago but to have it from the comforts of a 5-star hotel room, I say wow! I love Niagara Falls (and ice wine too for that matter). The do a great job with the night shows don’t they? My favorite view was taking the zipline flying head first towards Canadian Falls. Of course, we stopped before we got there but it was so beautiful on the way. What a marvellous birthday treat. 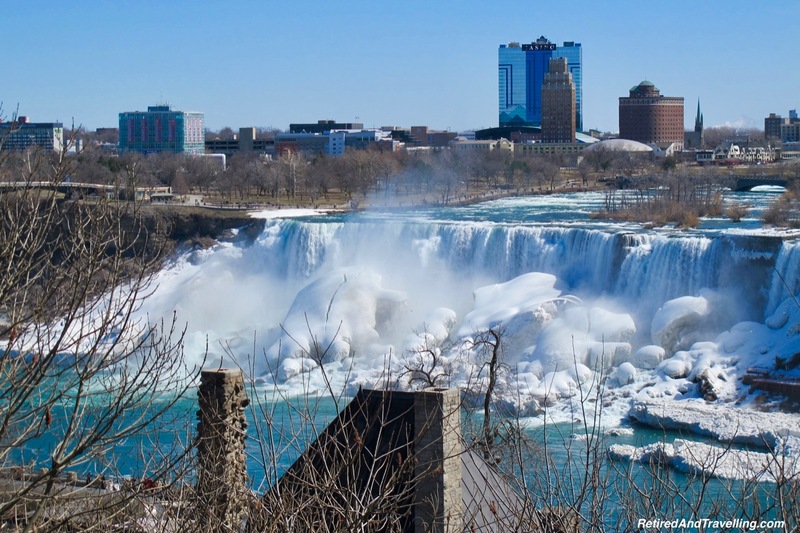 To see Niagara Falls in all its glory must be quite breathtaking. Fallsview Marriott certainly looks like a great place to stay given its location above the Horseshoe Falls. 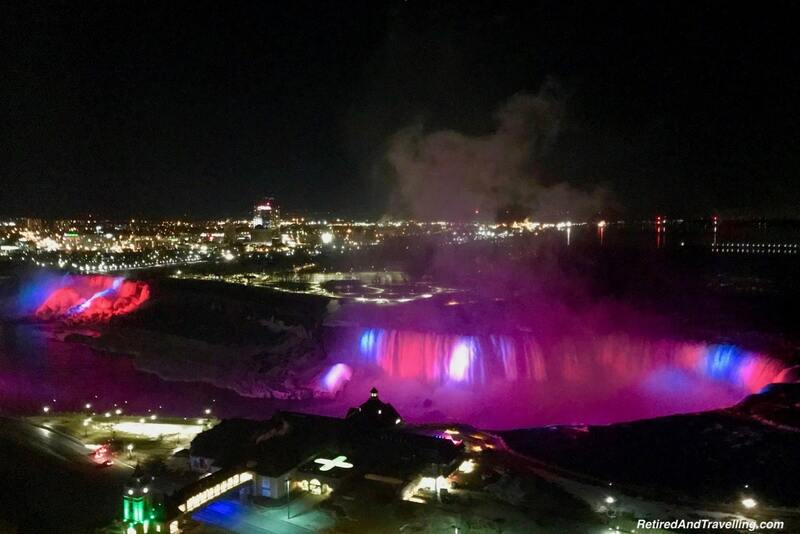 The two-hour night light show on Niagara Falls is a sight to behold. The rainbow lights on both Horseshoe and American Falls made me go ‘WOW’. I’d love to see that one day. I don’t blame you for not walking down along the upper walkway. Why would you when you have the perfect view! I’ve been to Niagara Falls and have seen them from the US side. 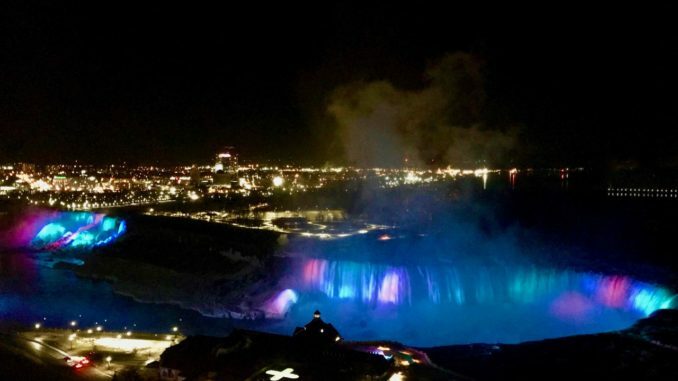 Even though the falls are majestic, my overall experience wasn’t that great since I had booked a tour with a tour company that was very bad in time management and we ended up reaching the falls way later and the light show was over. Meh. Would definitely want to go back again. Thanks for sharing about this interesting place. I would love to be there in Niagara and enjoy the scenery. Wow, what amazing colours at night. You’re so lucky to be living within driving distance of one of the world’s wonders. I’m hoping to visit later on this year. The view from Fallsview Marriott is fantastic! And to get Spa , massages to pamper yourself is icing on the cake. Niagara really isn’t a one day’s affair. 🙂 I do not know what is looking better in your gorgeous photos. The colorful falls, the rainbow, the sunrise or that ship looking so small compared to the falls. And that was a great way to celebrate birthday. Wish you a very Happy Birthday Linda. Very nice! I want that kind of birthday celebrations.. ha ha. 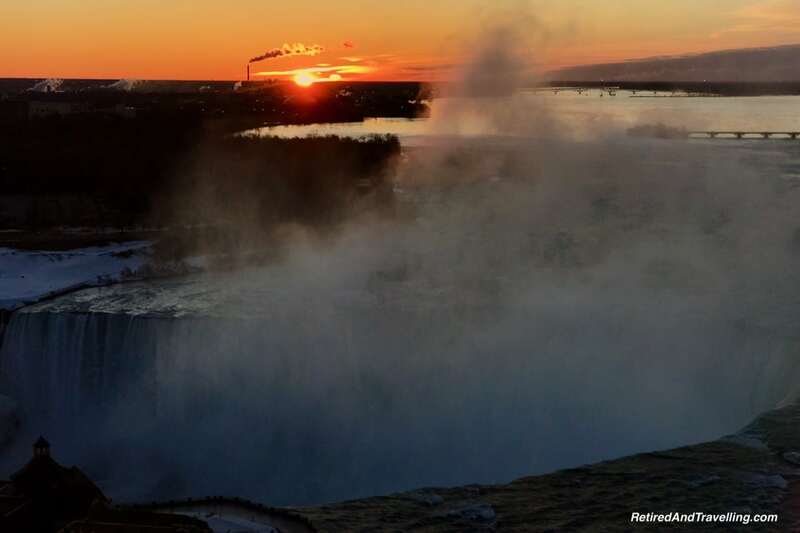 I love the photos from the evening where the Niagara Falls is lid. I never knew they do that. 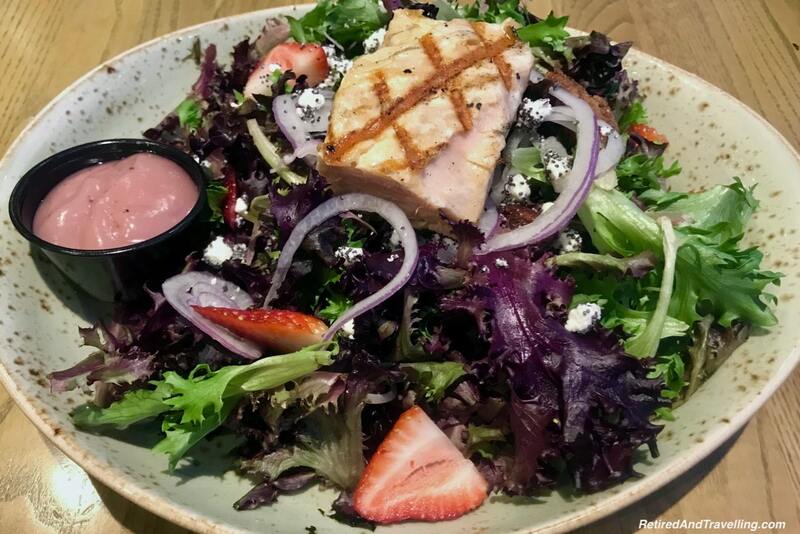 Also, the foods look so great. You definitely deserved it. Happy Birthday! What a lovely way to spend your birthday! I absolutely loved Niagara on the Lake when I visited 4 years ago and it was only by chance, that our jet boat trip on the Niagara Falls was cancelled so they decided to take us to Niagara on the Lake instead. Also, we stayed in a fallsview room, can’t rememebr which hotel, and it was a magical experience! Especially watching the colourful falls at night from that vantage point, which was right next to the bed in our room! 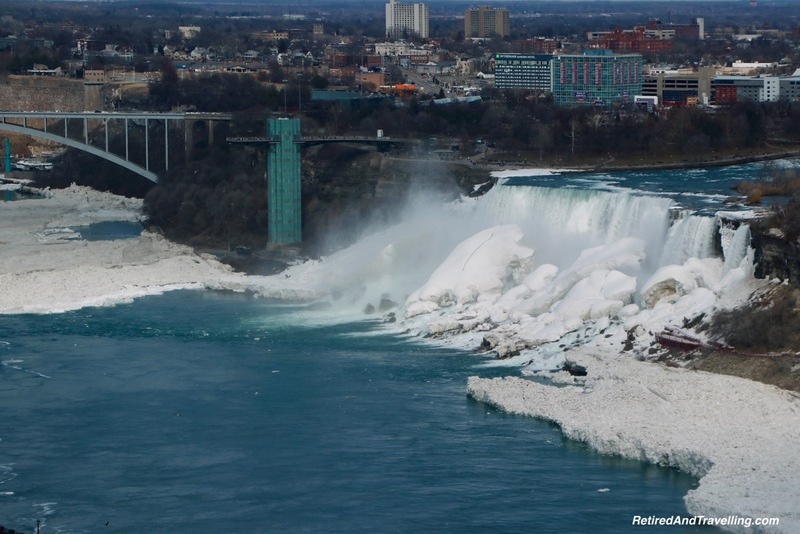 Wow… I have seen Niagara pics before but these are completely different! I think the pics from a distance are offering better frames. Also, I did not know that there are such lightings in the evening.